At the Oxford Alpine Club we recognise that different climbing destinations require different styles of guidebook. A guidebook not only needs to be factually accurate, but must promote and enhance adventure; it must be clear and easy to use on the belay, whilst being interesting enough to read in bed or in the bar; it must capture the spirit of a destination and provide motivation to go out and explore; it should make your life easy when planning a trip for the first time. An OAC guidebook must do all of those things with a personal feel to it. We do not mass-produce books, or hide their character behind a corporate image, so when you buy an OAC guide you get a very individual product - a labour of love, created by climbers, for climbers. Our future guidebook projects rely on local experts to provide the inside knowledge, and ensure that our guidebook will be the authoritative source for future visitors. To that end, we are always on the lookout for new authors... So if you have been collating route information to a climbing destination that you think other people might be interested in then we'd love to talk to you. Our publishing packges range from full editing, publishing and sales, through to simple ISBN allocation. 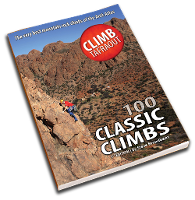 The ultimate guidebook to the quartzite trad climbing around the Jebel el Kest and Jebel Taskra massifs, including almost 1500 routes from roadside, single-pitch crag climbs to 800m mountain adventures. This is a selective guide in that it describes 79 of the best crags, but does offer comprehensive coverage of those crags. 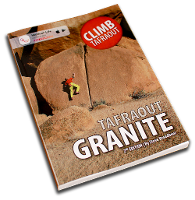 A modern, full-colour guidebook to the superb granite cragging around the town of Tafraout, describing almost 250 climbs all within 7km of the town, including sport-climbing, trad-climbing, and selected bouldering circuits. Focusing on the longer, multi-pitch routes, this guidebook will suit climbers who seek a reliably good quality mountain day - It's aim is simply to get you to the crag, up the route, and back down without wasting hours hours getting lost. One hundred of the region's best and most significant climbs are described in superb detail, including 1:25k approach maps and annotated route topos. Whether you're a first time visitor, or making multiple return trips, this guide will help you find and enjoy the very best of Tafraout climbing. 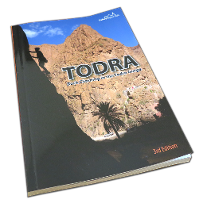 Describing 466 sport and trad climbs, this new Pocket Guide is the most comprehensive and up-to-date topo currently available for this exotic climbing destination, featuring photo topos for 30 of Todra's most famous and popular climbing sectors, alongside detailed maps and background information. 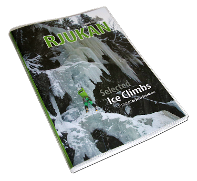 Oxford Alpine Club's Rjukan guidebook is your essential companion for a memorable climbing trip, helping you get the most out of a visit to what is arguably Europe's best ice climbing destination. The valleys of southern Norway are a dream winter destination for British ice-climbers, with reliable conditions, favourable weather and easy access from the UK. Hornby's guide to the Setesdal valley, 4 hours west of Oslo, is set to open up a major new centre for Norwegian ice climbing to rival ever-popular Rjukan. The essential guidebook to more than 300 routes on 20 crags across the south side of Jebel el Kest, with comprehensive coverage of the best crags. This volume includes everything from the superb cragging at Robin Hood Rocks, Palm Tree Gorge and the infamous Tizgut Gorge, to high mountain routes at Anergui and the ascent of Jebel el Kest, as well as the most popular multi-pitch climbs in the region on Tifghalt’s White Tower. It also includes selected granite trad, sport, and bouldering. From the roadside, single-pitch routes of Tarakatine and Tizi Gzaouine, to the mighty multi-pitch adventures on the Asseldrar Thumb... from the iconic Great Arch at Sidi M’Zal, to the world-class cragging on Idaougnidif’s White Dome, this volume describes some 350 climbs on 16 crags along the eastern front of Jebel el Kest and Jebel Taskra, including comprehensive coverage of the best crags in this winter trad paradise. The stunning valleys of Afantinzar and Samazar provide some of the best and most adventurous climbing in the Anti-Atlas. This volume describes 17 of the best crags, including more than 300 routes... everything from single-pitches at Anammer, to the brilliant and almost roadside multi-pitch outings on Lower Eagle Crag... as well as world-class cragging at Ksar Rock and Dragon Buttress, through to 800m alpine ridges in the jaw-dropping Samazar Valley. 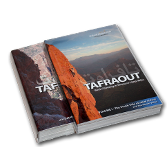 The long awaited Tafraout guidebook, combining all the previous guidebooks to create a single guide to this paradise of adventure-trad climbing. Now includes 2000 climbs, described in more detail than ever before, with all-new full-colour topos throughout, and the most detailed and accurate maps ever drawn of this amazing region. 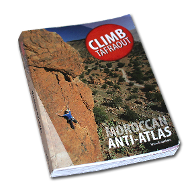 Published by OAC in 2010, this is the definitive guide to rock climbs on the north side of Tafraout's Jebel el Kest in the Moroccan Anti-Atlas mountains. Of Mountains and Men is an epic quest started by chance in a small graveyard not far from the Matterhorn, in the Swiss town of Zermatt. Three young British students – William Bell, Ian McKean, and James Ogilvie, “friends from Oxford killed together while climbing the Matterhorn in 1948” – are buried there. 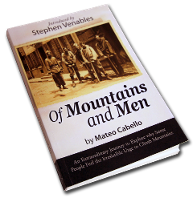 Intrigued, the author decides to find out more about them, and soon what began merely as a whim becomes an extraordinary journey that takes the reader from the heart of the Alps to Oxford and the Scottish Highlands, via the sandy beaches of Mauritius and the snow-capped peaks of Bolivia and Kenya.